Posted by M Bharath Bhushan in agitation, Bhivandi, Culture, English, Identity, Mulki, Photos, politics, regionalism, struggle. 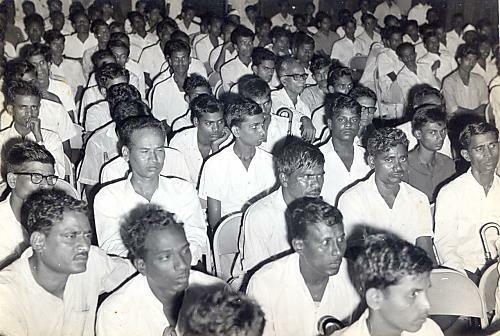 Telangana separate movement of 1969 was not only a mass movement in Telangana, but also in the neighbouring states. Separate Telangana movement inspired Telugu community all over the country. Bombay and neighbouring districts in Maharashtra were in support of separate Telangana. Telangana movement of those years is marked by great activism and people’s participation, dialogue on socio-cultural and political economy issues of post separate Telangana state. 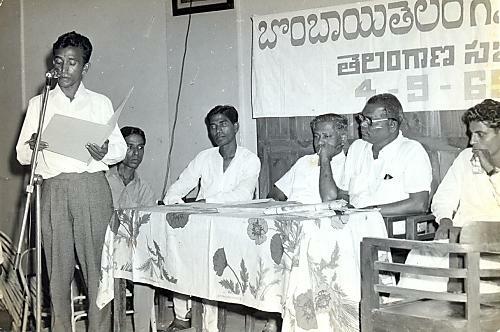 Bombay Telangana Samithi was formed on September 4, 1969. Separate Telangana agitation of 1969 stirred the hopes and drew activists from neighbouring states as well. There was also a Telugu monthly published during that time by Sri Ram Das, who later contested for Maharashtra Legislative Assembly. 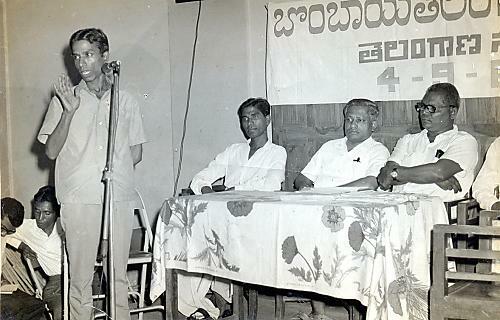 Five pictures of Bombay Telangana Samithi, presented here, reflect peak days of the struggle. Hope these pictures delight friends engaged in collection of materials about 1969 Telangana movement. 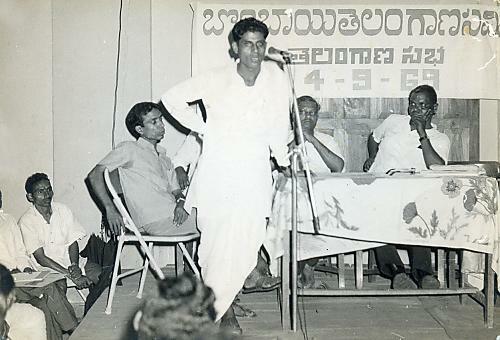 Mamidi Ramakantha Rao, sub editor of Andhra Bhoomi and Editor of Telugu gadda weekly was active in Bombay Telangana Samithi and in building support base for it among Telugu people in Maharashtra. Other speakers include Sri Ram Das and other activists from various parts of Maharashtra. We are collecting these source materials on Separate Telangana Movement of 1969. Discovery Telangana is part of this effort and is associated in this mission. 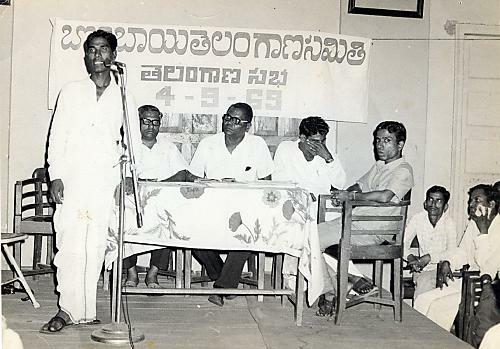 Any information about who the other speakers are is highly appreciated We shall share a few more source materials, archives of the journals published during the 1969 struggle, pictures and other publications that emerged out of the 1969 Telangana Movement.